Join a community of inspiring people who care about the American landscape and support this special place where American art was born. Become a member or renew your membership online now or call 518.943.7465 ext. 4. Learn about this growing organization and what we’ve been up to with the support of members like you. Members at all levels are invited to a Members’ Preview Weekend on Saturday, April 27 and Sunday, April 28. Visit the New Studio from 11 am to 2 pm to see our new exhibition Thomas Cole’s Refrain: The Paintings of Catskill Creek before the crowds. Read about our membership levels here and scroll down to become a member. Members form the backbone of the organization and enjoy free admission to the Thomas Cole site, discounts on programs and shop merchandise, an invitation for two to members’ events, a subscription to the newsletter and more. In addition to the membership benefits listed above, Sponsors receive one select Thomas Cole Historic Site publication and four free guest passes. All of the above plus free admission for two to all Thomas Cole public programs such as lectures and hikes, additional guest passes, and an additional invitation for two to members’ events. Members at the Benefactor level are especially committed to continuing the legacy of Thomas Cole and enjoy exclusive Benefactors events and communications. 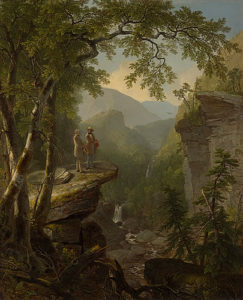 Asher B. Durand, “Kindred Spirits,” Oil on canvas, 1849, 44 x 36 in. Courtesy Crystal Bridges Museum of American Art, Bentonville, AR. The Kindred Spirits Society brings together enthusiasts of American art and Thomas Cole’s revolutionary creativity in support of this place where American art was born. Their generosity supports all aspects of the organization including education, scholarship and preservation. Activities include exclusive curatorial tours of special exhibitions and private events with lecturers. Annual dues start at $2,500 and all donations are tax-deductible to the full extent of the law. For inquiries call Jennifer at 518.943.7465 x 6 or email jgreim@thomascole.org.